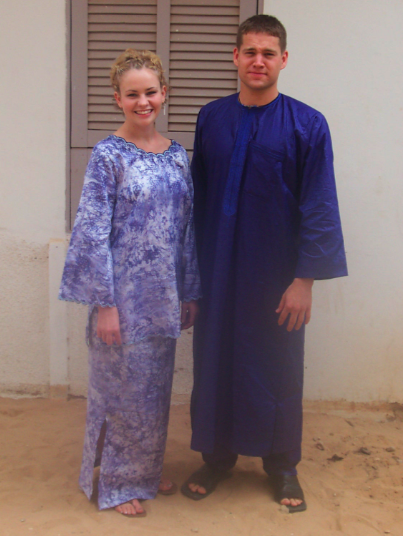 My friend Jenn did a great post (as always) for 1st timers to Senegal. She invited other bloggers in these parts to do the same. So here’s my take: answers to 10 questions people often ask us when coming for a visit. The better question is ‘how little can I get away with packing in order to leave the max amount of space in my bags to bring you guys American treats?’ Just kidding. Kind of. Beyond the normal packing list, I’d suggest a small flashlight for power cuts and streets without lights, serious bug spray and an itch stick, even more serious sunblock, handy wipes and any medications you take regularly (even OTCs). And before you leave, email yourself scanned images of your passport ID page and a list of the phone numbers for your bank and credit cards, just in case. Us as 1st-timers. 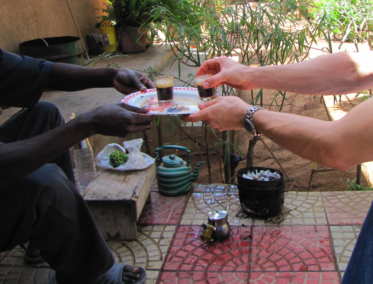 Our first Senegalese holiday – Tabaski 2003! 2. Can I wear shorts? That depends. Here in Dakar, Senegalese men only wear shorts for playing sports or exercising. Senegalese women (especially if they are married) don’t wear them at all. However, you do see tourists wearing them. It’s usually part of a combo pack: shorts, camera, sun hat, sunburn and trail of people trying to sell them something. 3. Can I take that man/woman’s picture? Probably. But just as back home, people may be weirded out by a person walking up with a camera in front of their face, snapping away at whatever they are doing/wearing/eating. Be respectful and ask first. They may say no, or they may ask why you want to. 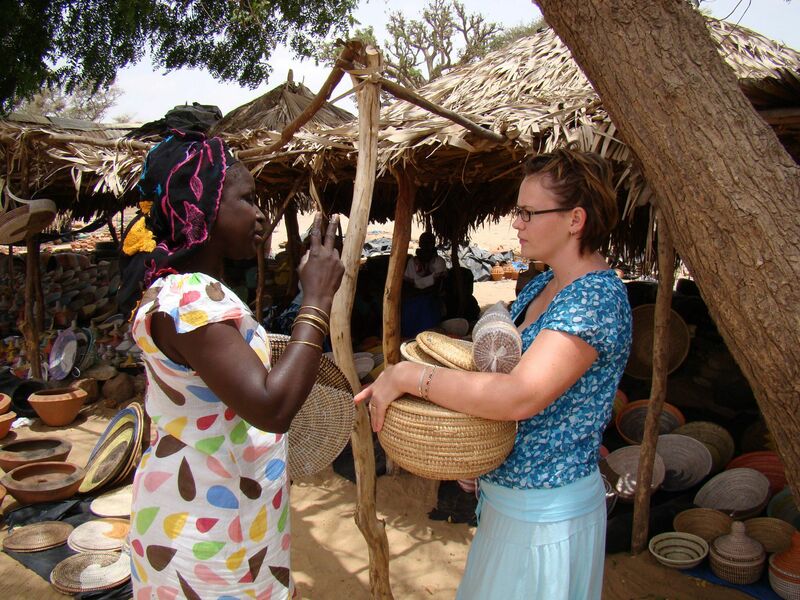 Great chance to talk and get to know Senegalese culture better. Just ask this kid all your questions. He’s practically Senegalese. I probably don’t know. But let’s go greet the person standing next to it and then ask them to explain it to us. That brings up a good point. Greetings are very important. Jumping right into asking a person a question (for directions, the time, a price) without first greeting them and asking a couple polite questions (How’s the day going? How’s work?) is considered very rude. 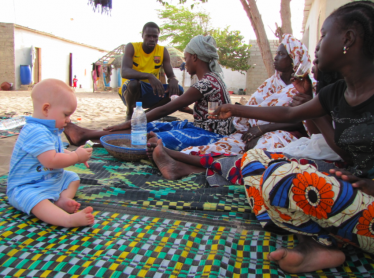 Even if you don’t speak Wolof, greet them as best you can before asking them a question. 5. Which Senegalese foods should we try? But you at least need to eat yassa (carmelized onion sauce, usually with chicken, over rice) and ceebu jenn (amazing fish and rice, similar to paella). Squeeze lime over your food and be sure to try the hot piment sauce. And have a glass of bissap (cold hibiscus tea) after your meal. 6. Did I get a good price? A wise woman with many years in West Africa (Hi Karen Conkle!) once told me you’ve never overpaid if the price was worth it to you. So odds are good I will never tell you that you’ve overpaid because prices, even fair taxi rates, are subjective. However, here’s a bargaining tip. Take their first asking price and cut it in half. That’s probably about right. Got my bargaining face on. 7. Why does everyone chew on sticks? Senegalese toothbrushes. Wanna try one? Some even have natural fluoride. 8. How do I eat this? With your right hand. Left hands are dirty. Very dirty. Don’t touch anything (especially people or food) with your left hand. You can quietly spit out any bones into your right hand or spoon, then place them under the lip of the bowl or tray. See that piece of cloth under the tray? After the meal, they’ll gather it up and throw away the discarded bones and such. 9. How do I drink this? If it’s hot, like the local tea called attaya, slurp it through your teeth. Go on – make some noise! 10. Can I come back? Anytime. Just remember than January through April is great weather. May, June and December are warmer. Only true friends and close family come in July-November. And we love you for it. Thank you for those wonderful insithgs! I’ll be thinking about them prayerfully for a long time to come. There is much we can learn from their simple and relational way of life. I’m so glad you had this experience and shared in it together. I pray it will have a lasting impact in the way you greet others, share and eat together and thank God and you for these gifts. Awesome…thank you for sharing this important info. Agree with all! Great tips for newcomers!